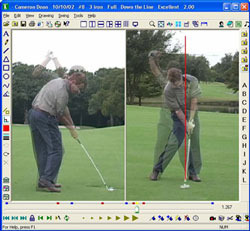 cSwing 2008 is an advanced video swing analysis program for avid golfers and golf professionals. It captures video from your camera to your PC. You can easily analyze your swing with its powerful drawing and comparison tools. Seeing your swing alongside pro swings provides immediate visual feedback that will result in lower scores. We offer easy-to-use, full-featured software available by download or on CD. We give you a complete suite of tools and pro swings to help you or your students improve. Get started right away by downloading our Free Trial which includes sample swings. Check out our Swing Library that includes more than thirty PGA Tour players including three Major winners. The swing coaches for Masters and PGA champions use cSwing with their touring pros. cSwing is used by players on the PGA Tour. Read what some of our customers from more than seventy countries say about cSwing in our testimonials page. See how it can help improve your game too! cSwing is customizable for any sport or activity where analyzing motion and tempo is important. Applications that our customers are using it for include physical therapy, kinesiology, baseball, polo, softball, football, wrestling, bowling and hockey.